I know it might sound like science fiction. But some of the world’s top anti-aging researchers now say it’s entirely possible to live to 120 or even longer. Better yet, that’s while staying healthy, active, and vibrant… and without losing your independence or quality of life! And Global Age Watch says the number of people living to 100 has shot up by 71 per cent in the last ten years, and increased more than five-fold since the 1980s. That’s why I’m so excited about a new scientific discovery that can add 20, 30, even 40 healthy, vibrant years to your life. What’s more, it can have a dramatic effect on your energy, immunity, and brainpower right now. Thanks to this life-transforming breakthrough, you can dial back the clock 20 years in as little as 4 weeks—and start growing younger right before your very eyes. You’ll actually FEEL it as your body grows healthier and more energized… your brain starts firing on all cylinders… your skin becomes smoother and younger-looking… and your vim and vigor return to levels you haven’t seen since your twenties or thirties! 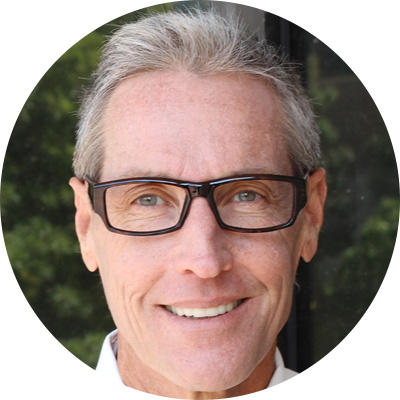 Dr. Russell Canfield, MD is a practicing integrative family physician focusing on anti-aging and wellness medicine. 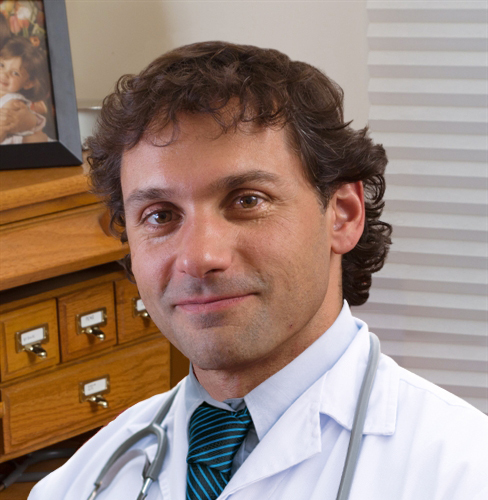 Dr. Canfield is certified by both the American Board of Family Medicine and the American Board of Integrative Holistic Medicine. He graduated from the University of Buffalo, SUNY School of Medicine and Biomedical Sciences and is based in Santa Fe, NM. My name is Dr. Russell Canfield. 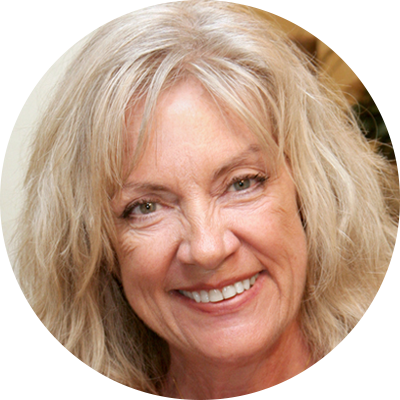 I’m an integrative MD specializing in anti-aging and wellness medicine in Santa Fe, New Mexico. Many of my patients come to me after the conventional medical system has failed them. They want to free themselves of health problems that are stealing their precious energy and vitality. They want to avoid dangerous, pricey drugs… and add many more healthy years to their lives. While the patients I treat all have a wide range of symptoms and problems, I’ve found for many there is one underlying cause. What is it? A common yet often overlooked deficiency that robs your body of its “vital force”. This common deficiency is what causes your body to slowly decline and give in to the devastating effects of aging. Yet once this deficiency is corrected, it’s as if aging gets put on “hold”. Within weeks or even days you begin to grow visibly younger, sharper, and healthier. The transformation can be downright amazing. Yet most doctors never test for this common deficiency. That’s in spite of a recent University of Michigan study1 that shows it’s more important to your health than your weight… whether you smoke or drink… or even your cholesterol or blood pressure levels! That’s right, all these years you’ve been nagged about losing a few pounds… guilt-tripped about enjoying an occasional drink or two… and bullied into taking costly and side effect-riddled cholesterol or blood pressure drugs… while this REAL underlying trigger for aging and disease has gone completely ignored! It’s time to STOP the nagging, guilt-tripping, and bullying—and let REAL healing begin! This hidden deficiency that speeds up aging and disease is the lack of a crucial molecule called glutathione (gloo-ta-thigh-own). Glutathione is literally the vital force of your body and one of the main keys to lifelong health and healing. In fact, the same University of Michigan study I mentioned earlier found this powerful molecule is responsible for at least 24% of your good health as you age. Yet NONE of my patients had heard of this hidden cause that leads to so much disease and illness… nor have they been told what to do about it. What happens when your body starts to lose its vital force? Without enough glutathione, your entire body starts to slow down. You lose your ability to fight off illness and ward off cellular damage. Your immune system struggles to fend off health-damaging oxidation and toxins. And your recovery time from illness or simply overdoing it lengthens. …You suffer from poor or only fair health—you get sick often, you don’t move well, and you feel tired and old. …Your energy takes a nosedive, your muscles become weaker, and your “get up and go” has got up and gone. …Your memory starts to fail you and you become more forgetful, have trouble focusing, and worry you’re losing your edge. …Your immune system becomes weakened and you seem to catch every “bug” that’s going around—and your body is less able to fight off more serious health threats. …Your vision worsens, you can’t see as clearly even with the same eyeglass prescription, and your risk of becoming blind increases dramatically. …Your heart doesn’t beat as strong, your blood flow grows sluggish, and fatty build-up on the walls of your arteries sets you up for a sudden cardiac event. …Your blood sugar levels start to climb and your waistline thickens, putting you at risk of metabolic syndrome—in other words, prediabetes—or worse. …You get short of breath easily when climbing stairs or simply walking, or you experience other breathing problems. …Your sinuses often clog up with mucus, making you cough or constantly clear your throat. …Your liver becomes overloaded, making it unable to do its job of detoxification. So your body becomes even more prone to the damaging effects of free radicals, toxins and pollutants. …Your digestion gets out of whack, and you suffer from indigestion, heartburn, acid reflux, constipation, or excess gas—not to mention POOR nutrient absorption, leading to even more health problems. …You start to lose your vital glow—instead of sparkling with robust vitality, the light inside you becomes diminished and you appear dim and gray. What does a healthy, vital person look like? They GLOW. They have vitality—that spark of energy and life itself. What does an unhealthy older person look like? NO glow. NO vital force. You want to be that healthy, vital person who glows and keeps glowing as you age. With that glow come all the other wonderful things you associate with good health: being able to feel, look, move, and perform like you did a decade or two ago… for the next 20, 30, even 40 or more years of your life! You can see why restoring your levels of glutathione—your body’s “vital force”—is so important. It’s simply the best way to stay healthy and vital as you get older. It also helps you bounce back faster and more easily when you do get sick or hurt. Other research shows healthy older people have 11 times more glutathione than older people with poor heart health, and over 7 times more glutathione than those with poor blood sugar control. And another study found that 100-year-olds with the best health and ability to function had the highest levels of glutathione. It’s no wonder glutathione may well be the secret of healthy people who never seem to age! People like entertainers Bob Hope and George Burns… composer Irving Berlin… two-time Oscar winner Olivia de Havilland… actresses Doris Day and Zsa Zsa Gabor… and Presidents Jimmy Carter, Gerald Ford, and George H.W. Bush. Some of these octogenarians and centenarians are still going strong… while others lived well into their late 90s or 100s! Who wouldn’t want to live to a ripe old age—while looking and feeling years younger? It all starts with glutathione. By boosting your body’s production of glutathione, you can control your ability to age well. It can even enhance your longevity. Take a look at a study conducted at the University of Louisville2. Researchers measured glutathione levels in 87 women ranging from age 60 to 103 years. They found that ALL of the women had very high blood glutathione levels. And ALL of them were in excellent health, as verified with physical exams, diagnostic bloodwork, and other assessments. The researchers then followed these same women for five years and came to the following conclusion: “high blood glutathione concentrations… are characteristic of long-lived women.” No wonder some of these women lived into their 100s! This kind of link between glutathione levels and health has been proven time and again. It became crystal clear in one recent British study. 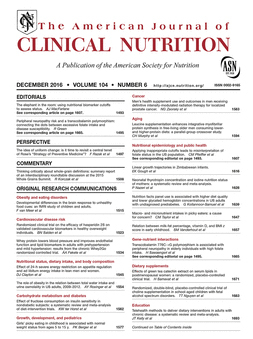 In the study, researchers measured glutathione levels in 4 separate groups: healthy young adults, healthy older adults, older adults with chronic illnesses, and seriously ill older adults who were hospitalized. Guess where each group ranked in terms of their blood levels of glutathione? And older, hospitalized adults had the LOWEST levels of all! In order to live a longer, healthier life, you must have ample amounts of glutathione in your body. Scientists now believe it may be the single biggest predictor of good health and longevity as you age. And over 80,000 published studies have shown that glutathione plays a key role in detoxifying your body and promoting peak health. Yet as I mentioned earlier, you may be walking around with HALF as much glutathione as you had when you were in your 20s or 30s! And if you suffer from any chronic health problems, your levels may have dropped even lower. 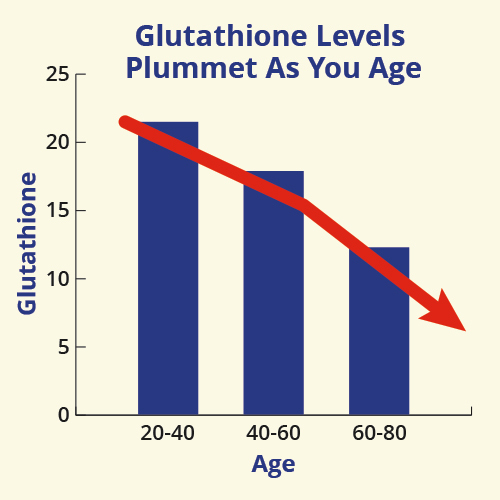 Why is it so important to maintain high enough amounts of glutathione as you age? As I mentioned earlier, it’s because glutathione is such a powerful antioxidant. Not only does it help protect every cell and organ in your body, it’s crucial for detoxifying your body of the chemicals, pollutants, radiation, and other poisons that all of us are constantly bombarded with. Your body uses glutathione to neutralize these dangerous toxins when they enter your body. This powerful molecule helps scrub out every toxic particle of dirt, dust, sludge, and waste products that’s clogging up your body’s systems and damaging your cells and organs. Glutathione contains sulfur, which is a “sticky” molecule. Toxins and free radicals stick to sulfur just like flies to fly paper. They’re then bound up in the stool or urine and eliminated when you go to the bathroom. Detoxifying is a big job—and it takes a lot of glutathione! For starters, your liver requires large amounts of glutathione, since it’s your body’s most important detoxifying organ. Your lungs also need high amounts, because they use 1,000 times more glutathione than other parts of your body. That’s because every time your liver or lungs have to neutralize a toxin, they use up glutathione. The more toxins that overload your body, the more glutathione you need. Yet the more toxins overload your body, the more they deplete your levels of glutathione. It’s a vicious circle. That’s why it’s so important to boost your body’s levels of glutathione so you have a steady supply to combat this menace. The problem is, it’s difficult if not impossible to get glutathione from food. In fact, unless you eat a raw food diet, you’re NOT consuming enough glutathione! Cooked, pasteurized and processed foods contain little to no glutathione. Only uncooked raw vegetables, fruit, raw eggs, raw unpasteurized milk and dairy, and raw or rare meats are rich in glutathione. But most of us don’t eat this way. What about taking a glutathione supplement? You might think it would be easy just to take glutathione as a pill. But glutathione is a small protein molecule—and your body digests protein before it can be absorbed. As a result, little to no glutathione is able to enter the bloodstream and pass through the blood-brain barrier when you take it as a supplement. So you don’t enjoy any benefits. That’s why I’m so excited about a new breakthrough solution. This powerful combination of well-researched nutrients works better than anything I’ve seen before to increase your body’s production of glutathione to “young again” levels. I’m also going to tell you about a new discovery that allows you to supplement directly with glutathione—to complement what your body produces on its own. This combined approach has the power to restore your body’s glutathione levels in just months or even weeks! This exciting new anti-aging discovery is called Vital Force: Glutathione Booster™. This cutting-edge supplement contains 7 well-researched ingredients designed to raise your body’s glutathione levels dramatically. 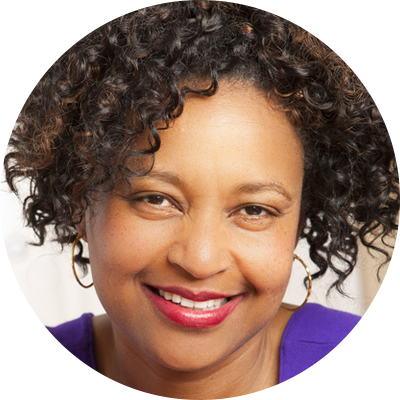 Your skin looks younger and you begin to “glow” with renewed health and vigor! Scientists and medical researchers around the world agree this one nutrient is the single most effective at raising your body’s levels of glutathione. Over 33 gold-standard, placebo-controlled, human clinical studies show this nutrient improves your health and quality of life by increasing glutathione in your body. And one Stanford University researcher hails this nutrient for its ability to reverse glutathione deficiency. What is this nutrient? It’s N-Acetyl Cysteine, or NAC for short. Remember better and focus more! In fact, Dr. Atkuri’s own published research study examined the results of taking NAC that were seen in 46 placebo-controlled clinical trials. He found that over two-thirds of these studies showed a measurable improvement in health and quality of life for people taking NAC. Study after study proves dramatic benefits—in as little as one hour! Lets you breathe freely and easily: One study found patients given NAC raised the amount of glutathione in their blood and lungs in 1 to 3 hours… increasing their lung capacity. Fends off dangerous toxins: Research shows NAC shields you from toxic pollutants and contaminants that drain “vital force” glutathione and threaten your health. Builds more muscle so you get leaner: Two double-blind, placebo-controlled human studies found people who took NAC significantly increased lean muscle instead of fat. Boosts immunity and wards off colds and flu: Another study found older adults who took NAC for 6 months were more than two-thirds less likely to catch the flu or flu-like illness. On top of these impressive health benefits, it’s completely safe. 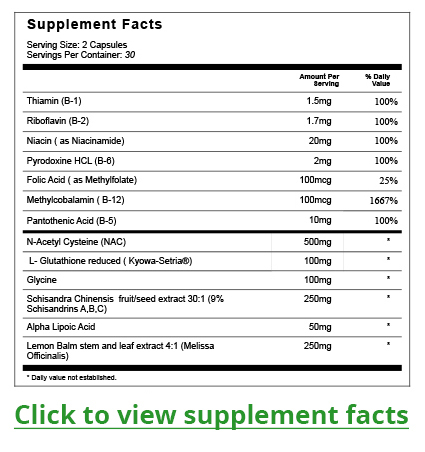 NAC has been used and studied for decades, and NO negative side effects have been reported. That’s because NAC doesn’t artificially change anything your body already does. It’s just providing the “raw material” that goes missing as you get older, so you can boost your glutathione levels naturally… change the way you age for the better… and stay younger longer! Vital Force™ gives you a generous 500 mg of N-Acetyl Cysteine in each daily serving, similar to the amount used in studies. Only the highest quality NAC is used from grass-fed source whey protein, and it’s in an easily-absorbed form so you can enjoy the maximum benefits. This next glutathione-boosting breakthrough may be a berry, but it’s not like any berry you’d find at the grocery store or mix with yogurt. It’s a Chinese medicinal berry blessed with multiple healing properties that’s been used for more than 2,000 years… but it’s virtually unknown in the West. It’s called Schisandra and it’s so powerful at restoring glutathione, it’s known as the “glow berry”. In fact, a group of leading scientists and experts conducted an exhaustive review of 928 herbs claimed in Chinese medicine to have anti-aging powers. They narrowed down the field to a mere handful shown to actually be effective—and Schisandra made the cut. Not only that, these top experts found the primary anti-aging effect of Schisandra was to restore a person’s “glow” or vital force. To be more scientific, this means it increases levels of glutathione in your mitochondria, the power generators of your cells. Why is this so important? Because the more antioxidant support you have in the mitochondria of your cells, the more energy your cells can produce. As a result, the greater protection you get against oxidative stress in your brain, heart, liver, skin, and immune system… and the better all of your body’s systems can function! You can see how amazing Schisandra is for your health. That’s why each daily serving of Vital Force™ includes the highest quality Schisandra fruit extract, standardized to 9% schisandrins. That’s nearly 5 times the minimum recommended amount of these potent, youth-restoring compounds! So far I’ve told you about NAC and Schisandra. Together they can send your body’s production of glutathione soaring—and help reverse the deficiency that may be making you feel older than your years. Now I’m going to share with you another glutathione-boosting nutrient you get in Vital Force™. It’s so powerful it can even shield your cells from the destructive effects of medical radiation! Every day, your brain and body are under assault from dangerous toxins. You’re exposed to dangerous environmental poisons like pollution, heavy metals, and chemicals. You’re even being slowly poisoned by medical treatments that are supposed to make you healthier. One Harvard Medical School professor suggests this “pandemic” of toxins may well be stealing your brainpower. He recently calculated that Americans have forfeited a collective 41 million IQ points in a recent paper published by the National Institutes of Health. And that’s just taking into account the hazardous effects of the most commonly-used toxins. That’s NOT counting the toll on your brain, heart, lungs, skin, and every cell and organ in your body from lead, mercury, arsenic, phthalates, BPA… and more than 1,241 other dangerous compounds the CDC warns you’re exposed to in thousands of everyday products. Some of the WORST offenders are medical radiation and certain drugs. These treatments rob your body of vital force glutathione. As a result, your cells and organs suffer permanent DNA damage and can’t reproduce healthy cells to replace those that are lost. It’s like putting the aging process on fast-forward! The good news is, a natural herb called lemon balm may provide a powerful shield against these toxic threats. It not only fends off DNA damage, it supercharges your body’s glutathione levels. Take, for example, people who work in medical radiology. Every day they’re exposed to toxic radiation from X-rays, cat scans, and MRIs. Is lemon balm strong enough to protect their cells and organs from the damaging effects of this daily dose of radiation? According to researchers who conducted a recent study, the answer is a resounding yes!9 They found that radiology workers who simply drank a cup of lemon balm tea twice a day for 30 days experienced dramatic improvements. The workers’ glutathione levels increased—giving their cells and organs greater protection against radiation exposure. Meanwhile, signs of DNA damage and other free radical damage decreased. That’s pretty amazing just for sipping a few daily cups of tea for a month! Lessens the toll of toxins on your brain by more than HALF! Imagine how toxic the effects of medical radiation are on your body. Just to get your teeth X-rayed at the dentist, you have to put heavy pads on your chest. What’s even more frightening, Americans are exposed to more than seven times as much radiation from medical procedures as was the case in the early 1980s, due to increased use. Yet this natural herb is so powerful, it can help ward off radiation’s harmful effects. It can do the same for even the most toxic drugs. While you likely don’t use any street drugs, you may use prescription or over-the-counter medications. Many of these drugs contain chemicals that can be toxic to your brain and body. On top of that, you’re constantly exposed to dangerous heavy metals, pesticides, and air pollution. That’s why boosting your body’s level of protective and detoxifying glutathione is so important. Vital Force™ gives you a high quality standardized extract of lemon balm in each daily serving. Not only does lemon balm keep toxins from stressing your cells and vital organs, it can actually help ward off emotional stress so you feel calmer and more relaxed! Raises Glutathione Levels by More Than One‑Third in 6 Months! Until this new discovery, researchers struggled to find a way to make a glutathione supplement your body could easily absorb and use. Fortunately, they were able to find alternative ways to boost glutathione production with nutrients like NAC, Schisandra, and lemon balm, which I just told you about. These cutting-edge nutrients help your body turn back the clock by revving up your body’s production of glutathione naturally. But now there’s a way to get this youth-restoring molecule directly into your body’s cells and tissues. 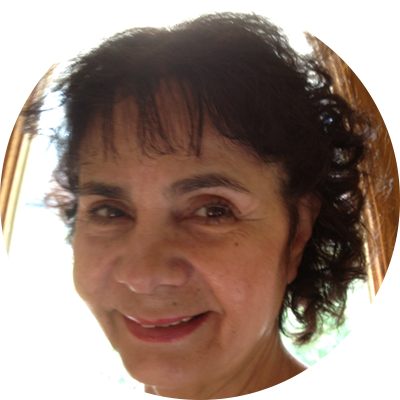 That’s right, earlier I told you why your body has difficulty absorbing glutathione directly. It’s because glutathione is a protein molecule—and your body digests protein before you can absorb it. So you get little if any benefit. But now a discovery called Setria® Glutathione is changing that. It’s made using a patented fermentation process that makes it more bioavailable. When you take this special form of glutathione, it provides a layer of protection to the gastrointestinal (GI) mucosa. These cells move food along your digestive tract and protect against incoming toxins. This protective layer of glutathione removes toxins before they can enter your bloodstream. It also supplies crucial glutathione to immune cells in your digestive tract. This is something no other nutrient can do. As a result, instead of being broken down and destroyed in your digestive tract, Setria® Glutathione is able to be absorbed into your bloodstream… and travel to your cells, tissues, and organs where they’re needed most! What’s more, taking this special form of glutathione boosts the function of natural killer cells—so crucial for immune function—by more than twofold after just 3 months! When you’re in your twenties and thirties, your body works like a lean, mean machine and can make as much glutathione as you need. But as you get older it needs some help. It doesn’t just need the “raw materials” like you get with NAC, Schisandra, Lemon Balm, and Setria® Glutathione. It needs your body’s mechanism for producing glutathione to work smarter and faster, since it slows down with age. That’s why I also included two powerful “helper” nutrients in Vital Force™. These two nutrients are Glycine and Alpha Lipoic Acid and together they can produce miraculous results. They work in different ways but with the same goal: to make your body more efficient at producing glutathione. Let’s start with glycine. Glycine is one of the building blocks your body needs in order to make glutathione. In fact, it’s the precursor to glutathione production. That means it’s like the clay a sculptor starts with in order to produce something magnificent. Your body does the same with glycine… turning it into age-reversing, energizing glutathione! That’s why I made sure to include it (along with N-Acetyl-Cysteine or NAC) in Vital Force™. But that’s not all. You also get alpha lipoic acid. This crucial nutrient is the “missing link” needed to help your body turn cysteine into glutathione. In fact, one study suggests age-related decline of glutathione in the brain may be due to a deficiency of alpha lipoic acid.13 When alpha lipoic acid is taken, cysteine levels increased 54% within 12 hours… and brain glutathione levels were restored! Alpha lipoic acid is also known as the “mitochondrial antioxidant”. This means it’s able to boost energy production in the mitochondria—or powerhouses—of your cells, and slow cellular aging. Alpha lipoic acid is also hailed for its ability to support healthy blood pressure, improve blood flow, and promote proper blood sugar levels. 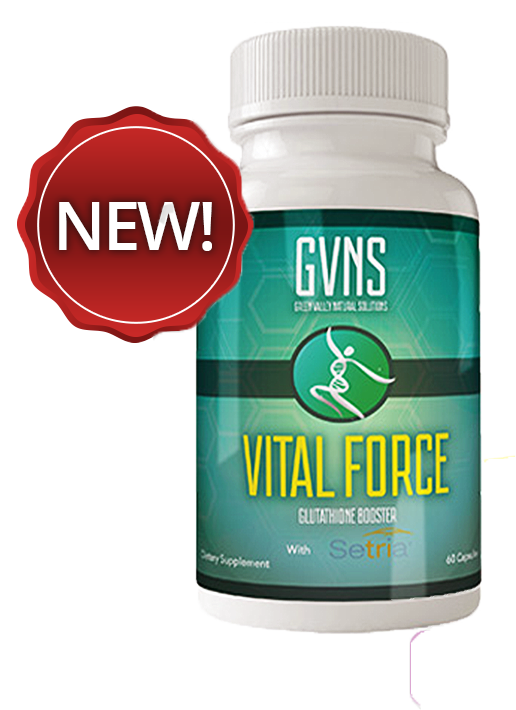 You get this powerful nutrient, along with glycine, in each daily serving of Vital Force™. You also get one more powerful combination needed for your body to produce glutathione… and keep your heart, brain, and arteries healthy as you age! Chances are you’ve heard someone say, “I’m sick and tired of being sick and tired.” Maybe you’ve even said it yourself. Well guess what? Not only could a glutathione deficiency be the culprit, a common vitamin deficiency could also be to blame. I’m talking about a deficiency of B-vitamins—in particular, vitamins B6, B12, and folic acid. These nutrients are essential for a process called methylation, one of the most important biochemical functions in your body. Methylation is responsible for making, maintaining, and repairing DNA, your genetic code. When this function is working the way it should, the less desired genes are switched off while the preferred genes are switched on. As a result, energy, immune function, blood pressure, cholesterol, brainpower, and hormonal balance remain optimized! On the other hand, when you don’t get the nutrients you need to support methylation, the undesirable genes stay switched on—leading to illness and decline. But that’s not the only reason you need optimal levels of B-vitamins. Your body also needs them in order to make glutathione. Plus they do something else that’s very important… they keep your body’s homocysteine levels under control! Everyone has homocysteine in their blood, but too much can affect the health and flexibility of your arteries and put you at risk of a sudden cardiac event. Too much homocysteine can also impair mental function and cause your brain to actually shrink! The good news is, research shows you can easily reduce the amount of brain shrinkage caused by high homocysteine levels. The study found that people with high levels of homocysteine who took vitamins B12, B6 and folic acid had 53% LESS brain shrinkage compared to those who didn’t take the B vitamins.14 That’s less than HALF! That’s why Vital Force™ gives you a complete, balanced B-complex, with the superior methyl forms of folic acid and vitamin B12. Not only does this complex help increase your levels of youth-restoring glutathione, it gives you superior support for your two most important organs: your brain and your heart. to claim your introductory supply of Vital Force™ now! You pay nothing today except shipping and handling—and you never pay another cent if you’re not satisfied! The statements on this page have not been evaluated by the FDA. Click here to try Vital Force™ without risking one cent! As time keeps marching forward, what will YOUR future look like? It’s an old cliché: “Time stops for no one.” But it’s true. We are limited by the time we have on this earth. Yet all too often we assume there will always be another day. Stop and think for a moment: What things do you want to do in the years ahead? What places do you want to see? Who do you wish to spend more time with? The challenge in front of you is to not take tomorrow for granted… but to take action right now to ensure your tomorrows are as full and plentiful as they can possibly be. I think you can see how the seven age-reversing, glutathione-boosting nutrients you get in Vital Force™ work together to keep your entire body functioning optimally for many tomorrows to come. They can help your body eliminate more of the disease-causing toxins and free radicals that have built up inside for decades. They can help you preserve your heart, brain, and immune function—so you can do the things you want, go to the places you want to see, and spend more time with the ones you love. And they can ensure you are able to think, breathe, dance, make love, follow your dreams, and live independently with gusto… well into your 80s, 90s, even 100s! Vital Force™ can also deliver dramatic health improvements right now! And feel healthier than you have in years, if not decades! Don’t you want to start enjoying these life-changing benefits right now—and pave the way for many robustly healthy and energized years to come? Don’t all of us? That’s why I want to make it as easy and affordable as possible for you to get the glutathione your cells need for decades more of good health. Put this breakthrough formula to the test for a full 30 days—on me! Simply say the word and I will rush you two bottles of Vital Force™. That’s a two-month supply valued at $99.90. You pay nothing today except for $9.95 shipping & handling. Why am I making such a ridiculously generous offer? Because I feel so strongly Vital Force™ can make such a dramatic difference in your health, I want you to try it yourself for a full 30 days at no risk. You pay only shipping and handling. I make no money on these costs—they barely cover what it costs me. If you aren’t completely thrilled with your results… if you aren’t feeling younger, healthier and more energetic… just call or email us within 30 days and you won’t be charged another penny. It’s that easy! 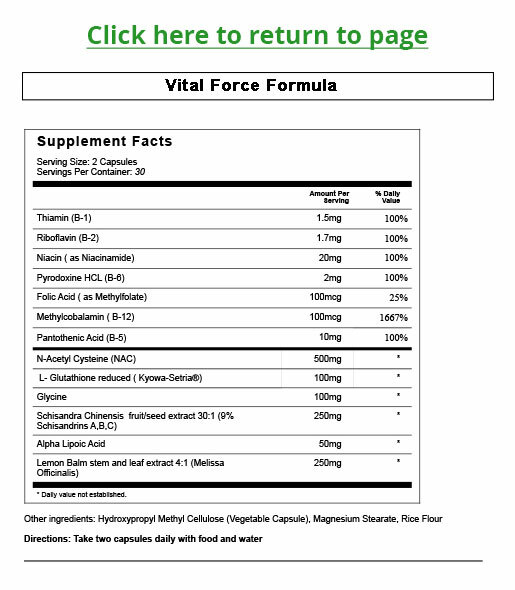 So click here to go to the secure checkout page and claim your risk-free trial of Vital Force™ now. You’ll be glad you did—for many robustly healthy years to come! P.S. If you were to try to find the exact forms and potencies of the 7 glutathione-boosting ingredients you get in Vital Force™ on your own, you’d likely end up spending $150 or even more. But as part of this special "buy now, pay later" offer you can get a two-month supply for just $9.95 shipping and handling—and put it to the test for a full 30 days without risking a penny. Simply click here now to take advantage of this exclusive, no-risk trial offer. Your future self will thank you! I’m so sure Vital Force™ will give more energy, improved memory and focus, stronger immunity, better sleep, and many other health benefits, I’ll let you try it for 30 days risk-free! Try Vital Force™ for 30 days risk-free. Just pay $9.95 shipping and handling and we’ll send you a 60-day supply of Vital Force™. If you’re not utterly delighted with your results by day 30, just call or email us, then send back the unused portion to us—and we will never charge you another cent. But if you’re like most people, we think you’re going to be thrilled with your results in just weeks or even days! This is a 100% ironclad guarantee, so you can’t possibly lose. I have enough confidence in Vital Force™ to take a chance and send you two bottles now for nothing but shipping and handling. You’ll see why I’m so sure when you try it. And it’s very important you do try it. I want you to see for yourself the incredible life-changing benefits Vital Force™ can bring you. That’s why I’m willing to ship you two bottles—a full two-month supply—entirely at my risk. You pay nothing today except $9.95 shipping and handling. If you’re not happy with Vital Force™ for any reason, just let us know within 30 days and you won’t be charged another cent. Even after your 30-day trial period your 100% satisfaction is guaranteed. You can return all unopened bottles at any time and receive a full refund of every penny you paid—no questions asked. You risk nothing by giving Vital Force™ a chance to work for you! J Clin Epidemiol. 1994 Sep;47(9):1021-6. CA Lang, Department of Biochemistry, U of Louisville. Song D, Hutchings S, Pang CC. Eur J Pharmacol. 2005 Jan 31;508(1-3):205-10. Lay, PY, et al. Oxid Med Longev. 2012. Panossian A, et al. J Ethnopharmacol. 2008 Jul 23; 118(2):183-212. Cell J. 2011 Spring;13(1):25-30. Epub 2011 Apr 21. Richie JP Jr, et al. Eur J Nutr. 2014 May 5. PubMed PMID: 24791752. Am J Clin Nutr. 2011 Sep;94(3):847-53. doi: 10.3945/ajcn.110.003483. Epub 2011 Jul 27. Arch Biochem Biophys. 2004 Mar 1;423(1):126-35.